After being made famous, Julian Assange’s first task is to wound a rival bank of the Rothschild Bank in Switzerland. The rival is Bank Julius Baer, the top Swiss bank for centuries: the competingRothschild Bank AG opened in Switzerland in 1968. Wikileaks’ leader Julian Assange accepts a CD from Rudolph Elmer which reveals tax evation by wealthy clients of Swiss Bank Julius Baer, a rival of the Rothschild Bank in Switzerland. 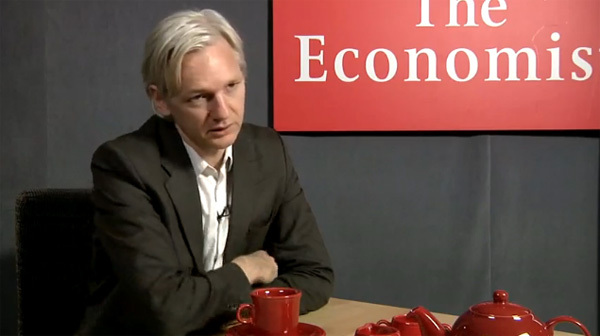 Wikileaks’ Julian Assange filming a video for The Economist (a Rothschild publication) which gave him its New Media Award. Zac Goldsmith (married to Kate Rothschild) winning the election with sister, Jemima Khan (nee Goldsmith) (right), and mother, Annabel Goldsmith.